Both her children taken by the Lathar and her home destroyed in the process, Amanda Kallson is at her wits end and desperate. With nothing left to tie her to Earth, she'll do anything to track down her daughters… even take an alien warriors crazy deal. It doesn't hurt that said alien warrior is tall, ripped and as handsome as hell. But Fenriis isn't the only warrior who has eyes for Amanda and while her ferocious mate is busy fighting off an outside enemy, it's one within who may steal their happily ever after before it even gets started. Small. Exquisite. He'll risk the wrath of the Emperor himself to make her his. It was supposed to be a quick in and out mission. After an attack on Earth, a planet no non-native was supposed to set foot on, Fenriis is forced to go down to the surface to make sure no enemy forces remain. But when he hears a woman crying, begging for help… from her gods, sure, but in their absence, he offers his aid. She's the most beautiful thing he's ever seen, and all she wants is to find her children. Since they're on his planet, how can he refuse to help… especially when she agrees to be his mate in return? But, in Latharian society, sometimes it's not the enemy you can see you need to watch out for. Sometimes the worst attack comes from the last place you'd expect. Forced to fight off her people and his… can he find her before it's too late? 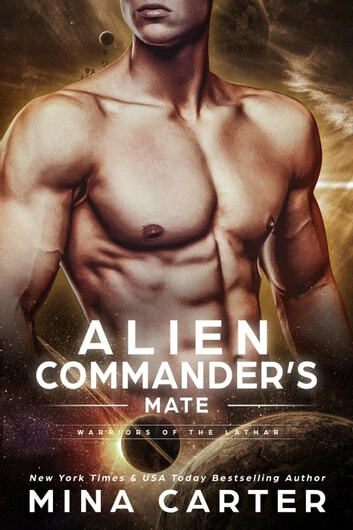 Title: Alien Commander’s Mate Series: Warriors of the Lathar Book #6 Release Date: #AlreadyReleased Author: Mina Carter Reviewer: Ingrid Stephanie Jordan Serial: Standalone, No Cliffhanger Genre: #SciFi #Alien #Warrior #5Stars⭐ •••••••••••••• Another romantic alien seeking his wrist band... Great book... Definitely a Must Read! ️Amanda Kallson has lost her daughters to Aliens. She willing to do whatever it takes to see them again. Anything! ️Fenriis K'Vass is a Alien- Lathar War Commander of the K’Vass. He has gone to earth to check on the Kallson women, instead he ends up making a deal with her. Love this series, would have liked a little more on the Fnaal character, but hoping this means there will be more in the series. Love the message in all the books about self image being based on character, strength and integrity rather than age or actual beauty. Keep it going! Love too that this one is about mature Mums doing everything they can to reunite with their children. Book Six was definitely a winner in this collection. Enjoyed getting to know Amanda and Fenris. What is a mother suppose to do when her children disappear from Earth? An opportunity to have a mate of his own Fenris offers her a deal she cannot refuse. The author provides such a vivid description of the characters they are easy to image. The storyline was definitely detailed enough to give the reader a full reading experience. Hated when the story ended. I really enjoyed reading Alien Commander’s Mate. From the start when Fenriis makes an impromptu decision through the courting of Amanda, he was ever the commander in charge and yet able to care and put Amanda first. There are a lot of action portions that both of them take charge in. As I jumped into this book I had to take a moment to realize just who Amanda was and why she was important. I had read the previous books and so it took me no time at all. If you haven’t read at least the previous book in the series, you would have a better understanding of the opening scene and Amanda if you did. However it is not necessary. Expertly written, it drew me in from page 1, unable to put it down until the last page. Loved it.